Family brings home baby wondering how the dog will react. How will the dog react to baby? This picture from Reddit member jpdisco. His family was a little bit worried how the dog, named Juno, would react the newborn baby upon arrival from the hospital. One look at the picture gives the answer. The look that this dog has is priceless. 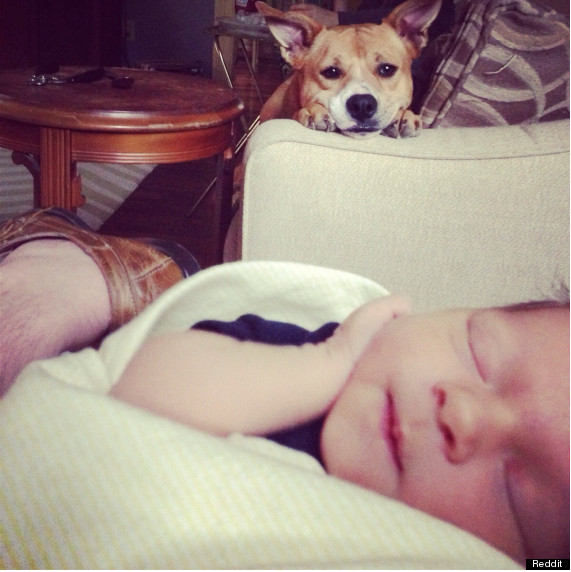 After the dog analyzes the newborn baby wondering what the heck it is, it he seems to shift saying, “I am going to be the best big brother to you baby.” He’s waiting patiently until the baby can play.